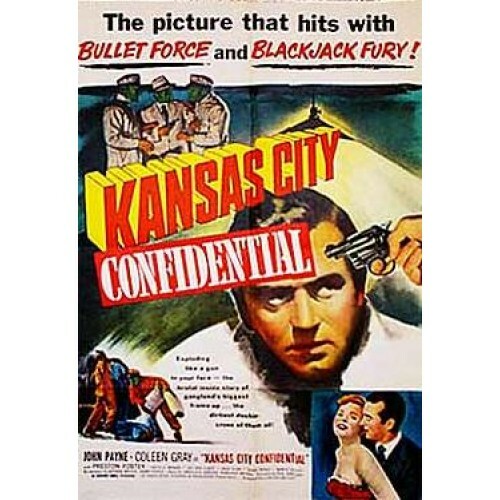 My friend Rob suggested I review KANSAS CITY CONFIDENTIAL awhile back, and I’m sorry I waited so long. This is a film noir lover’s delight, packed with tension, violence, double-crosses, and a head-turning performance by John Payne in the lead. Made on an economical budget like the same year’s THE NARROW MARGIN , director Phil Karlson and George Diskant create a shadowy, claustrophobic atmosphere brimming with danger at every turn. This entry was posted in Film, Film Review and tagged Coleen Gray, Cracked Rear Viewer, Gary Loggins, Jack Elam, John Payne, Kansas City Confidential, Lee Van Cleef, Neville Brand, Phil Karlson, Preston Foster, Through the Shattered Lens, United Artists. Bookmark the permalink.